Old Testament - Today in Leviticus chapter 14 we read about cleansing from skin diseases and treatment of contaminated houses. I found the treatment of the mildew in the houses quite fascinating - with verse 45 telling us about the ultimatum for a house if the mildew reappears - "It must be torn down, and all its stones, timbers, and plaster must be carried out of town to the place designated as ceremonially unclean." This chapter again goes into the clean & the unclean. If you didn't get chance to read the bible.org commentary on Clean & Unclean from Leviticus chapters 12 through 15, you may want to take a few minutes to read it at this link. Also, a sermon from Peninsula Bible Church with some interesting points on Leviticus chapters 13 & 14 titled "Sick Garments and Diseased Houses" is at this link. New Testament - Today in Mark Chapter 6 verse 46 we read – “Afterward he (Jesus) went up into the hills by himself to pray.” What a beautiful verse for each of us to meditate upon! Jesus went by himself to pray to God. It is interesting to note that this took place just after Jesus fed the 5,000. Jesus had been working hard – he is God and yet he still felt the call to pray to the Father. I think this verse is such a great reminder that you and I need to follow Jesus’ example in this verse. And we’re so not God! J So, think about how much more crucial it is for us to pray. Jesus knew that God was his source of strength. His comfort. His wisdom. And prayer was the one sure fire way for Jesus to really connect and spend time with God. How is your prayer life these days? Are you finding a good amount of time each day to be by yourself and pray? If not, can you schedule this time into your calendar each day? Proverbs - Today in Proverbs chapter 10 verse 11 we read – “The mouth of the righteous is a fountain of life.” WOW! I love this Proverb… on so many levels. The idea of a “fountain of life” is such a great metaphor! Because… I think what comes out of our mouth is so much like a fountain – and we are hopefully pouring forth Living Water for others. However, I imagine that there are times when our fountain is not quite so clean and we’re pouring forth something else. I think what I find so meaningful about this verse is that I have really been convicted even this past week of how important and impactful our words are to others. Our words can really build people up – or tear people down if we are not careful. I don’t know about you, but I know there are times in my life when I can be negative with what I say. And this does nobody any good. Then, there are times when I can be very positive and I feel like the enthusiasm is contagious to others. And these are the times when perhaps my words seem to be a bit more like a fountain of life. I guess I say all of this to just encourage you to reflect on the words that come from you – are your words typically a fountain of life to others? Will you seek to improve in love what you say and how you say it to others around you so that your words truly will become a fountain of life to others? Like Mike, I was touched by Jesus going off alone to pray. I have been doing that more often these days and it has brought me closer to Jesus. The thoughts on our words and what they can do caused me to think of the writing about the tounge in James (which we will all get to later on this year). As I read the beginning of this chapter, I heard the words, “Weren’t ten cleansed?” These are the Words of Jesus after ten men who had leprosy were sent to the Temple to show themselves to the priests in Jerusalem. 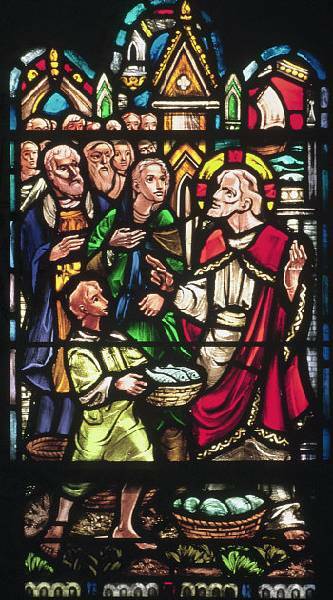 The text states (Luke 17:11-19) that the men with leprosy were healed as they went, so all were healed. Yet one man, a non-Jew, a foreigner, returned to Jesus after seeing that he had been healed and worshiped, 15 Then one of them, upon seeing that he was cured, turned back, recognizing and thanking and praising God with a loud voice; (AMP). Instead of sending him back on the road to Jerusalem, Jesus sent him on his way because he gave glory to God. The remainder of chapter fourteen is very personal to me. In December from the first through the tenth, the inside walls of my two bedroom apartment, as well as the inside exterior walls were taken down because I had mold within the walls of my apartment. I know what it feels like to be displaced while your home is being “gut” renovated while everything you own is still inside. I know what it feels like to have practically every upholstered piece of furniture thrown out because there is too much dust from the demolition and the fear that the mold has spread to everything. I went from a horrified fear to acceptance and thankfulness, I understood the passage in the book of Romans that states, “And be not conformed to this world: but be ye transformed by the renewing of your mind, that ye may prove what is that good, and acceptable, and perfect, will of God.”(Romans 12:2) The word translated “renewing” also means, renovation, complete change for the better. I recognized that my “apartment” experience had a real life application. As we are being transformed by the renewing of our minds, we may not even be able to live in ourselves because the walls are being taken down, even the sinks and the toilet. All I can say is “folks” gotta be running real fast to outrun a boat by passing rocky terrain. It would be such a blessing to see people pursue God with the same fervor that they pursue the world. Waiting, waiting patiently, waiting without crying out to God, “Where are you,” takes a deep abiding faith and trust in God. It takes assurance and a knowing that God will do what He says He will do. I have barley arrived to the place where I know that there is a God but my heart’s desire is to be as confident as David and state boldly, “I waited patiently for the LORD to help me, and he turned to me and heard my cry. The words that the godly speak may not seem godly when those words are spoken. I believe most of the time the words that lead to life cut through the pride, arrogance and greed of our lives, which are painful cuts. Some words “dung it”(Luke 13:8), to throw or let go of a thing without caring where it falls (Strongs’ Concordance), casing aside and loosening the soil of our lives preparing our hearts to receive the incorruptible seed that is the Word of God.